Eucerin Dry Skin Therapy Calming Creme 8oz has been formulated to help you with any skin ailment you may have. Designed to support all types, Eucerin skin care products can aid you with repairing, moisturizing, and calming your skin. ADW Diabetes offers a large selection of Eucerin skin creams and lotions in both single units and discounted bulk packs for your convenience. 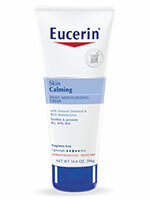 Eucerin Dry Skin Therapy Calming Creme 8oz is specially formulated to calm itchy skin and keep it moisturized. This gentle, non-greasy formula combines calming, natural oatmeal and rich moisturizers to soothe and comfort dry, itchy skin. Natural oatmeal and emollient-rich formula helps soothe dry, itchy skin. Free of fragrances and dyes. Ingredients: Water, Glycerin, Cetyl Palmitate, Mineral Oil, Caprylic/Capric Triglyceride, Octyldodecanol, Cetyl Alcohol, Glyceryl Stearate, Colloidal Oatmeal, Dimethicone, PEG-40 Stearate, Carbomer, Sodium Hydroxide, Phenoxyethanol, Benzyl Alcohol, DMDM Hydrantoin, Methylparaben, Ethylparaben. Note: Ingredients listed are based on the most current information available. Please refer to actual product packaging as formulations may change.